When the good people at Marijuana.com went through the WikiLeaks dump of the DNC emails, they found something unrelated to the trove of damning information on the criminal Hillary Clinton. Within the mountains of email texts, was a paid segment by the Wine & Spirits Wholesalers of America (WSWA), stoking fear within Washington, encouraging politicians to be wary of marijuana legalization. ** A message from Wine & Spirits Wholesalers of America: While neutral on the issue of legalization, WSWA believes states that legalize marijuana need to ensure appropriate and effective regulations are enacted to protect the public from the dangers associated with the abuse and misuse of marijuana. While the paid segment is not as fantastical as some of the claims coming from the reefer madness crowd, they are basing their paid propaganda on entirely skewed data. In May, AAA’s safety foundation released a report concerning cannabis impairment and driving, which proved blood testing drivers for THC holds no scientific validity and should be abandoned. But a second part of the report found that — strictly statistically speaking — car crashes involving drivers who had consumed cannabis were on the rise. In fact, the number of people involved in fatal crashes who tested positive for cannabis did rise — a statistical doubling — but several caveats to this information were flatly ignored by the mainstream and the WSWA for political advantage. This skewed statistic has been used by law enforcement, mainstream media, and the alcohol lobby to stoke fear about legalizing weed. Politicians and the public alike, are eating it up and demanding that we have something that can measure ‘how high’ someone is while driving. As Marijuana.com points out, Morgan Fox, communications manager for the Marijuana Policy Project, said that the alcohol industry has its work cut out for itself in combatting drunk driving and should be wary about being seen as impeding cannabis legalization. However, the alcohol industry does not make money by attempting to decrease drunk driving. As long as they can use the government to keep their competition illegal, however, they will. And, this email is evidence that they are trying to do just that. 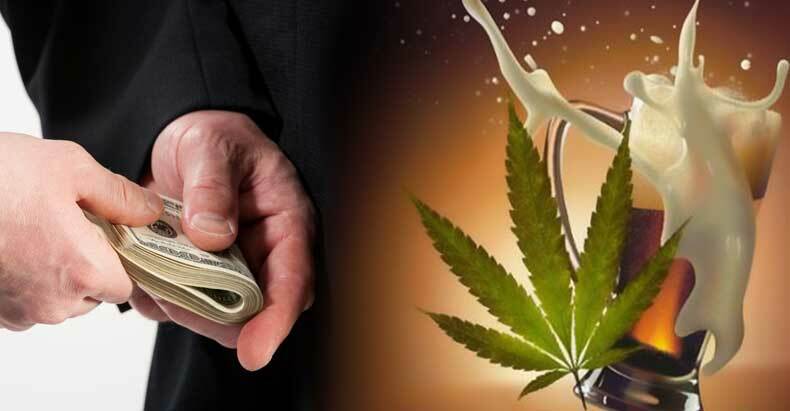 If you want to know who profits from ruining lives and throwing marijuana users in cages, we need only look at who bribes (also known as lobbies) the politicians to keep the war on drugs alive. Aside from the alcohol industry throwing money at tyrannical legislation, they are joined by law enforcement and big pharma. Alcohol and Beer Companies: These giant corporations hate competition, so why not pay millions to keep a cheaper and far safer alcohol alternative off the market? Case in point, the WSWA.